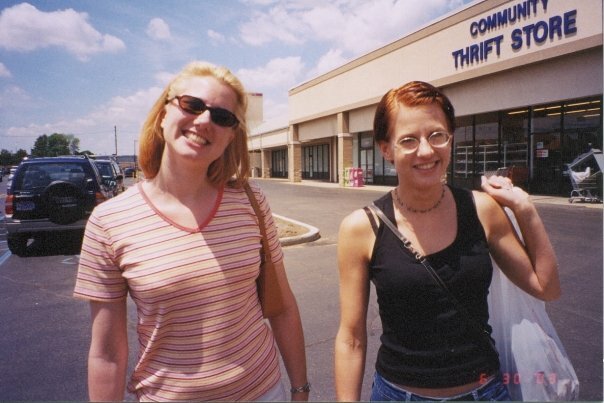 Straddled between a hard, urban center and it's suburban sprawl was the Community Thrift Store. Able to attract quality merchandise as well as questionable clientele, it was my absolute favorite store during my high school years. My parents provided us with the basics but any supplements, such as fashions and trinkets, we acquired on our own. Being a fashion follower from a young age that meant working as soon as I could, starting with delivering newspapers when I was thirteen (back when kids still brought them door-to-door). It also meant a series of part-time, low-wage jobs, affording me very little discretionary income. This lead me down the path road to thrift stores. Community Thrift Store was my favorite by far, with the most competitive prices on surprisingly good items with fast turnover and ever-changing selection. I can look around my house and see numerous treasures bought on the cheap. 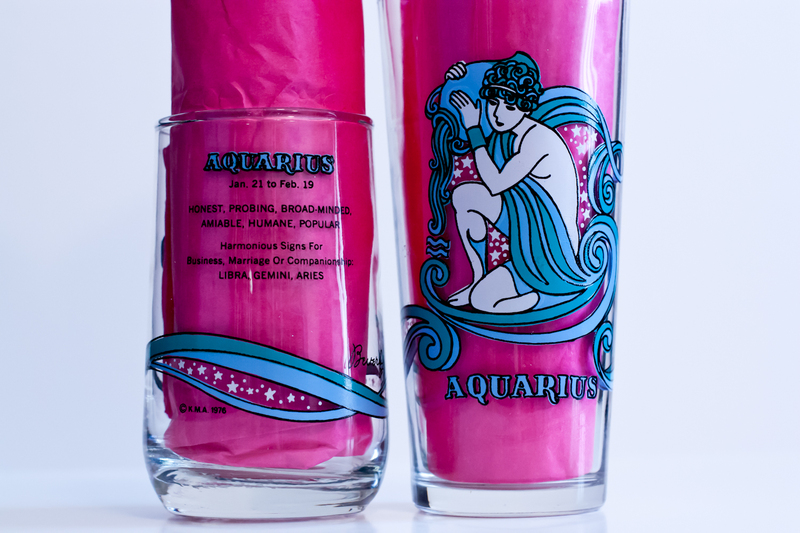 One infamous find was the Aquarius glass I discovered lost in a sea of nondescript and tacky glassware. I instantly knew that it's design would be my first tattoo. At the time I was maybe 16 and didn't even have my driver's license; I knew a tattoo was not in my foreseeable future but that glass was my hope and inspiration. Fast-forward about 5 years and I am sitting in some crappy, college house-apartment meticulously tracing the goddess-esque water bearer on thin paper in front of a shade-less incandescent lamp. In my wallet is a wad of hard-earned, convenience store-working money set aside for my very first tattoo. Today's Photo A Day topic is "stars". Without waiting until dark and literally taking a photo of the heavenly stars, I looked around my office because I knew there was some item with stars that would tell a story. Then I saw the carefully wrapped glass sitting quietly on my book shelves. Incorporated in the art work are tiny white stars. I still have the original glass purchased so long ago, the tall one on the right; I have carefully moved it all this time. For a number of years it was stored without access and nostalgia was tugging at my memory. With thanks to eBay I was able to find not only an identical pint-sized glass but also a tumbler with the same design. They are both copy-written 1976 (my birth year) but only the larger size is branded with the Arby's logo, suggesting it was a promotional item back when fast food restaurants actually gave out decent and usable collector items. I'll toss in a freebie photo for fun. This is my sister and I in front of the store's original location around 2003. It has since moved as I have since moved. I never visited their new location and have never found another thrift store quite as fantastic. Turkey and Wild Rice Soup.